As a young girl growing up in Las Vegas I had a lot of different interests but began to realize that when I would draw or paint it made me feel alive more than anything else! I realized I had a true passion for making art. I absolutely loved having the freedom to use my imagination and emotions to create something out of nothing and to have the freedom to express myself however I wished. I loved that there were no rules and to me it was a form of communication I felt much more comfortable with than simply speaking. 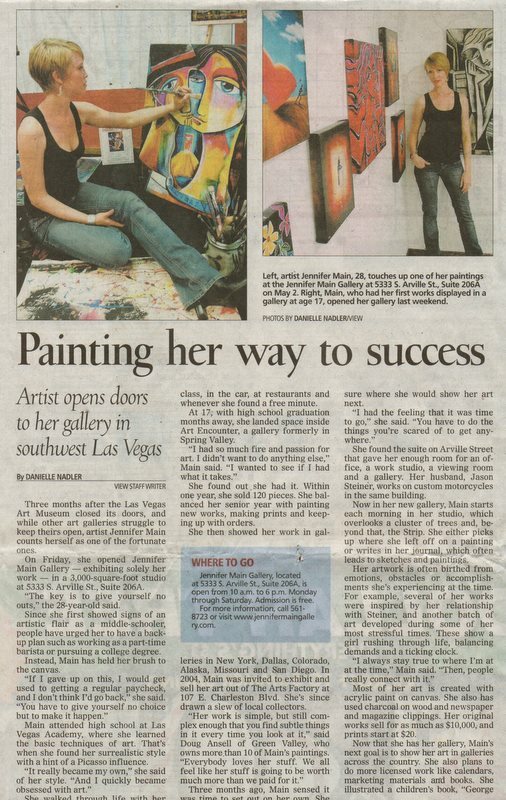 I knew I had a passion for art and wanted to pursue it further so I excitedly auditioned for a public arts high school and was accepted to the Las Vegas Academy as a fine art major and was able to learn a lot of the basic techniques and grow in my talent. During this time my style began to emerge. One of the key things for me was to take a sketch book everywhere I went and I would draw whatever came to mind. It helped me get feedback and find my artistic voice. I also loved sitting for hours in the ‘art section’ at bookstores and libraries just soaking in the work of my favorite artists starting with Salvador Dali, Pablo Picasso, Keith Haring, and Marc Chagall. By the time I was 17 I had made up my mind that I was going to be a full-time artist. I had a big dream and a clear vision of who I would become one day. I believe God planted this vision in my heart and I have never lost sight of it. All I can say is it was WAY bigger than me but I believed it was possible with God. I had no clue how it would all come together but I began to step out in faith and got started RIGHT AWAY! With the help of my mom I bravely but nervously made an appointment to show my work to a local gallery called Art Encounter when I was a Jr. in high school. My portfolio was made of two yellow poster boards that were stapled together with my various works tucked inside. Luckily they decided to take a chance on my work even though they had nothing like it in their gallery. I was THRILLED to say the least! Within the first week my work began to sell and continued to sell more and more. I was working hard to keep up with schoolwork and create new art for the gallery. To me this confirmed that I was made to do this and I was on the right path. I made up my mind that I would not go to college but instead open up my own art studio and pour myself into being an artist. This went against what everyone thought I should do. I was told I should get some type of degree and have a backup plan but I was determined to listen to what was in my heart. If I wasn’t going to go to college it also meant that I was cut off financially from my parents at 18 so I HAD to make this work. I got the keys to my own art studio just before graduating high school with the money I was earning from the art sales and devoted myself to creating art. My work continued to sell well and I became the gallery’s best-seller that first year with about 125 paintings sold! The owner of the gallery, Rod Maly, took notice and became my exclusive agent and began to market me and my work all over the country, especially in my hometown of Las Vegas. There was a lot of great press and things were moving quickly in the right direction! I was one happy hard-working young artist! I have had the honor and blessing of living my dream as a successful full-time artist ever since and this was only by the grace of God. I have shown my work in galleries all over the country and in Canada with collectors continuing to grow from all over the world. 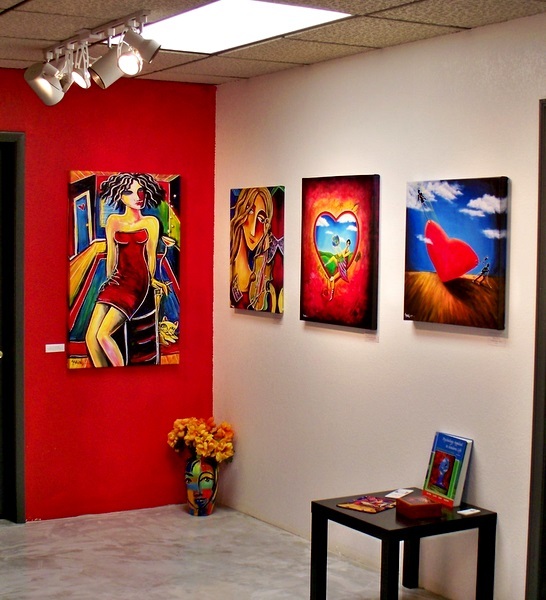 In 2002 I opened the ‘Jennifer Main Gallery’ in Las Vegas, moving to a few different locations over the years as I had the opportunity to grow. In 2011 God kept impressing on my heart that Los Angeles was to be my new home and to “Go forward”. I trusted his word and in 2012 my husband and I took a big risk and moved everything to downtown Los Angeles where I have now opened up my own storefront gallery in the business district. The constant support, loyalty, and encouragement from my fans blows me away and literally brings tears to my eyes. I AM SO THANKFUL! Without all of you none of this would be possible. It’s been an exciting journey for the past 15 years. It definitely hasn’t always been easy and it takes a lot of steadfast faith, hard work and persistence but I would never have it any other way and I LOVE what I do and can’t wait to see how the future unfolds! I feel it’s only just the beginning! No matter what I paint I love using bold vibrant color and to keep a sense of whimsy. I like painting exaggerated abstract figures from my imagination and use my work to illustrate the ups and downs of life’s beautiful journey. My goal is to share my heart openly and stay vulnerable on the canvas because I believe it keeps it real and relatable. My paintings are less about decoration and more about a message or deeper story. I have always been drawn to the duality of everything and enjoy themes of good vs. evil, happy vs. sad, light vs. dark, and pain vs. pleasure. You can’t have one without the other and it intrigues me. A lot of my inspiration comes from what I am personally going through and learning. I have learned from experience that some of the best things can potentially come out of the darkest times. My faith inspires most of my work these days as Jesus Christ literally saved my life from suicide and addiction and gave me a new life! Now I can’t help but share how amazing God is! It just flows from my heart! Following are some of the exciting opportunities I have had over the years. My work was on MTv’s “Real World San Diego”, HGTV’s “Million Dollar Rooms”, Discovery Channel’s “American Casino”, Cinemax’s “Sin City Diaries”. It was also featured in Bloomingdale’s Home store, Venetian’s Canyon Ranch Spa, and at the red carpet premiere of Warner Brother’s movie “Racing Stripes” starring Hayden Panettiere. 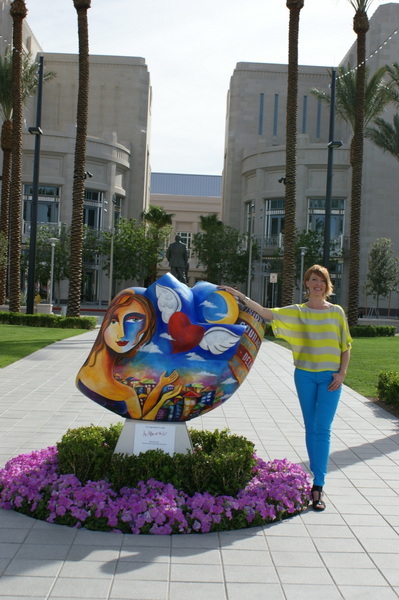 Two pieces are in the permanent collection at the Smith Center for The Performing Arts in Las Vegas with one of them being a large painted heart sculpture set prominently at the entrance. This sculpture raised $40,000 for St. Jude Children’s Hospital and was gifted to the Smith Center by the generous donor. I was selected to be the featured artist at The Wildflower Arts and Music Festival in Texas, The Jazz and Art Festival at Mt Charleston, Boulder City’s ‘Art in the Park’ in Nevada, and the Calabasas Fine Art Festival in Southern California. I had the opportunity to illustrate a children’s book by author Michael Chapman called “George the Giraffe Thinks He Has No Neck”. MeadWestVaco (the largest manufacturer of school supplies) published my art calendar internationally and my work was licensed for the cover and theme of two college level psychology textbooks. I also had an awesome opportunity to paint live portraits at the CRN Computer Industry Hall of Fame in Mountain View, CA. Some of these portraits included Jim Clark (venture entrepreneur and founder of Netscape), Alvy Ray Smith (co-founder of Pixar Animation), Ted Codd, Chris Date, John Seely Brown, and Bob Huang. I had the great privilege to be the artist in residence multiple years at various elementary schools in Alberta, Canada where I was able to teach my art style and share my story to kids from kindergarten to 5th grade and was invited to be a speaker at the GETCA Teachers Convention where I taught teachers new methods of teaching art. I believe it is so important to give back to the community that supports me and to various causes I have a heart for. God has blessed me immensely, giving me the talents and success to ultimately be used to help the lives of others in one way or another-whether financially, or through teaching, speaking, or volunteering. I have had the privilege of speaking and teaching at all Las Vegas Boys and Girls Clubs and Shade Tree Women’s Shelter in Las Vegas. 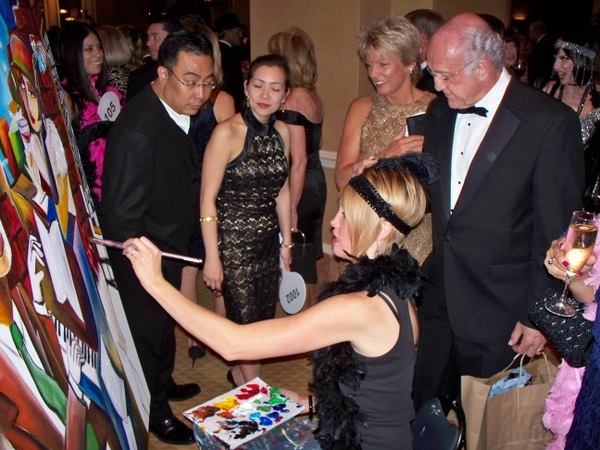 I paint live for many charities during their big fundraising galas, where the painting is auctioned off to raise fairly large sums of money. The most recent painting auctioned sold for $32,000 to benefit St. Jude Children’s Hospital. Other organizations I have consistently supported are March of Dimes, Grant a Gift for Autism, New Horizon Academy, Project Sunshine for Children’s Cancer and The American Heart Association to mention a few. It’s so rewarding to see how art can be used to do so much for others! Well that’s a bit of my story and how I got to where I’m at. Above all I thank God for the grace to be who I am and do what I do and for YOU who support what I do. I will keep on making art that I hope feeds the heart with good things and I look forward to what’s in store for the future!